The most recent fishing report for Missouri/Kansas is up at The Kansas City Star! The winds died down and warming trend finally arrived. Fishing turned out at a few lakes and will most likely get better in the coming week as the temperature continues to climb. The Lee’s Summit Area Fishing Facebook Group is gaining members fast and everyone is doing a great job of sharing the knowledge they have about local lakes. Walleye should be turning on soon once the water temperature hits 45-50 degrees. 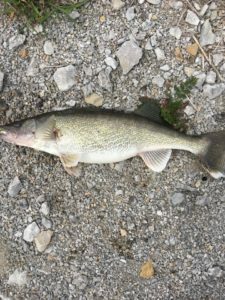 One member submitted a picture of this walleye caught off Longview dam. My resources for the fishing report include some great people and businesses. Be sure to check them out by clicking the links below! Fishing Report, Kansas, Kansas City Star, Missouri, Tyler Mahoney. Bookmark.